Tension escalates and violence ensues when a young student unwittingly breaks a non-aggression pact between two rival high schools. ‘Crows Zero II’ gets its rival gang leader! Time to shave that head! ‘Crows Zero II’ is looking for some skinheads! A transfer student attempts to take over the most violent high school in the country, whose students form factions and battle each other for power. Zebraman awakens fifteen years in the future, unclear on what has happened to him, and quickly discovers that the evil Zebra Queen has a hold on Tokyo. A visually stylish tale of two male prisoners bonded by emotion, love and murder. Takshi Miike is without a doubt one of the most productive directors in the world and one of the most famous personalities in the contemporary Japanese Cinema along with Takeshi Kitano. But if you produce a lot of films, the risk is rather elevated that some of them are filler material and this is also the case for "Crows Zero II". I think that this movie is only interesting for those who had really enjoyed the first part. Nevertheless, there are a few strong points in this Takashi Miike movie. As always, the music in this movie is great and introduces us once more into the Japanese alternative rock scene. A couple of bands even perform live in this movie in a cool underground bar. If you are a fan of that kind of music, you should get your Hands on the soundtrack instead of the movie itself. Another positive aspect are the settings and decorations. The gang locations in form of abandoned skyscrapers or schools in desperate Suburbs of big cities are quite original and have some charm by showing us the ugly face of Japan. The dark and dirty streets, underground bars and other obscure locations are very well chosen as well. The clothes of the different gangs are all very distinctive, too. Some actors also stand out with their very own style: we have the weird guy with a big scar in form of a cross on his cheek that has ugly teeth, we have a cool blond haired young Gangster and a brutal androgynous guy who looks harmless and is rather silent but turns out to be a brutal maniac. As you can see, this movie has quite some potential. The reason why it fails is the story itself. First of all, this movie lacks of a coherent story line and includes too many side stories that are not very interesting and add sometimes even an unnecessary slapstick touch to the movie. It's also quite hard to follow this movie as it's the case for many Takashi Miike movies. There are way too many characters, too many names and too many issues in this film. In addition to that, the director also included a few flashbacks to the first movie. Instead of making the movie clearer, these passages harm the already irregular flow of this sequel. Those who haven't seen the first movie will get mixed up and feel frustrated while those who have seen the first strike might feel bored. That's not a very smart move form the director. Basically, this movie introduces a couple of young gangs that are more or less controlled by Yakuza clans that get involved in quite brutal battles. The first few battles as well as the overlong final one might be interesting but the whole thing quickly gets redundant and turns out to be quite senseless violence without any aesthetics. There are way better movies by Takashi Miike like the great mafia flick "Family", the surreal masterpiece "Gozu" or the more traditional martial arts film "13 Assassins". 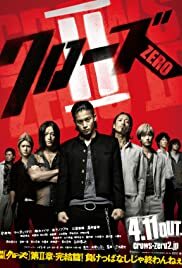 "Crows Zero II" is one of those unnecessary sequels that only a couple of die hard fans might appreciate and it is among Takashi Miikes weaker works because there is not enough content and originality in here but too many characters and a whole lot of senseless violence.